Who doesn’t like sophisticated, exotic and adult ice cream flavours? Well, quite a lot of people actually. Matters of taste are notoriously difficult to predict. But while many grown-ups harbour little love for more exotic ice cream flavours, most sceptics are probably found amongst the young. The solution – always make sure the household can offer some tasty ice pops. They require minimal efforts, have a number of benefits, may even be quite healthy and are always so very appreciated! 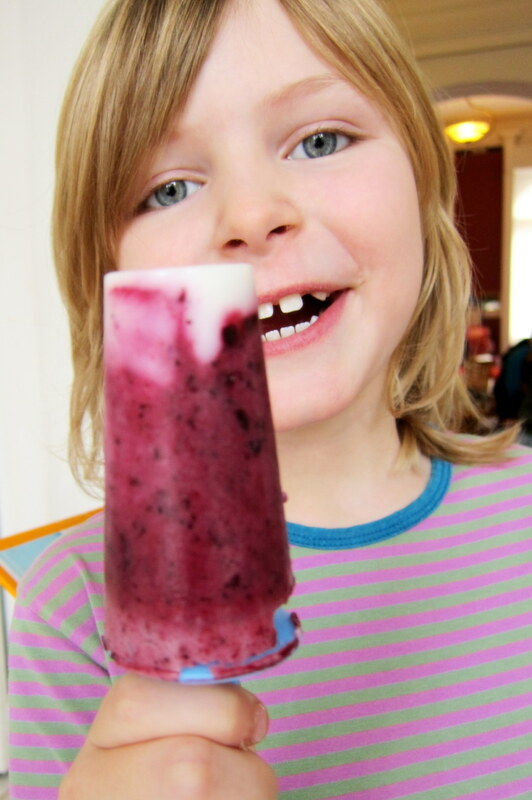 Ice pops – every household should have some! As I have mentioned before, it took me some time to start making ice pops (or ice lollies, if you like). But as soon as I had started, there was no turning back – I was actually quite surprised by the positive reception amongst my kids and their friends. While the children have become rather used even to some of my more esoteric ice cream flavours (or maybe just because of that) , tasty ice pops always seem to be enthusiastically received. Making your own ice pops comes with many benefits – it is fun, you decide exactly what goes into them, you can prepare them with (rather) healthy ingredients and they are greatly appreciated! Also, they are extremely easy to make. Just bring out your ice pop moulds, fill them up with about 60-70 % yoghurt of your choice (I used ‘normal’ low-fat natural yoghurt, one of our breakfast stables). Then add some good quality blueberry jam (depending on your preferences and the size of your moulds: about 1 tablespoon or so should probably be fine). You may, or may not, have to add some extra sweetening. While I try to limited the added sugar when making ice pops for my kids, this also depends a bit on the particular jam used. The jam used in the pictured pop was actually of so very good quality that it barely contained any sugar – I just had to add some more sweetness, and ended up adding about a teaspoon of honey per mould. Obviously, if your jam is already quite sweet, you might want to leave it at that. Then simply take a spoon, blend the yoghurt and the jam (and, possibly, any added sweetening) in each mould, and freeze them in your freezer. If you have problems getting the ice pops out of the moulds later, I suggest you just hold them (the moulds) under hot, running water for 15 seconds or so. Really – could it be easier? No excuses – make yourself or someone you love ice cream-happy already today! 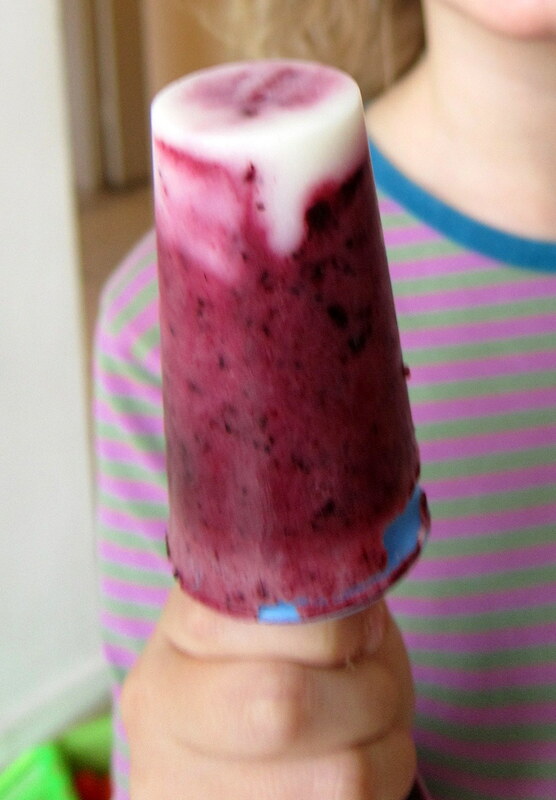 Blueberry yoghurt pops ! Not only do they look good – they taste good too! 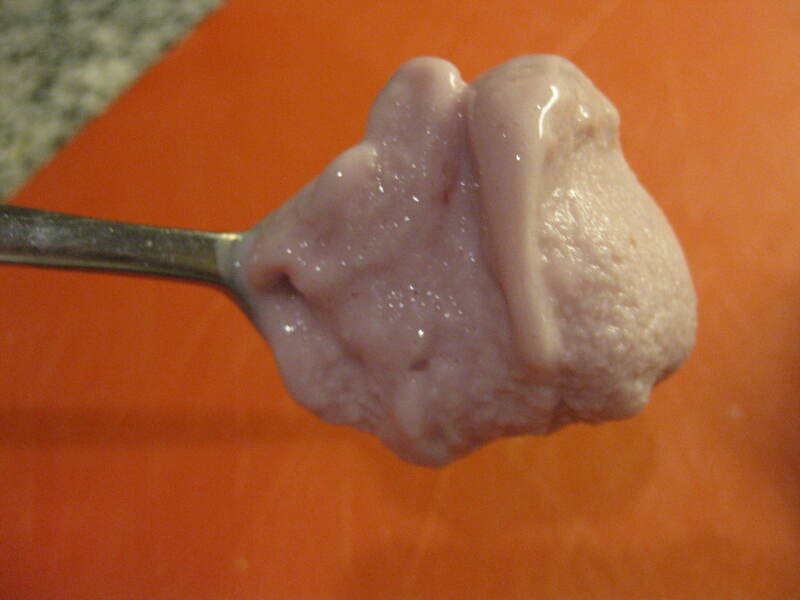 Fill the ice pop moulds up to about ¾ with yoghurt. Add about 1 tablespoon of jam per mould, and - if necessary - any additional sweetening you consider required for the sake of taste. 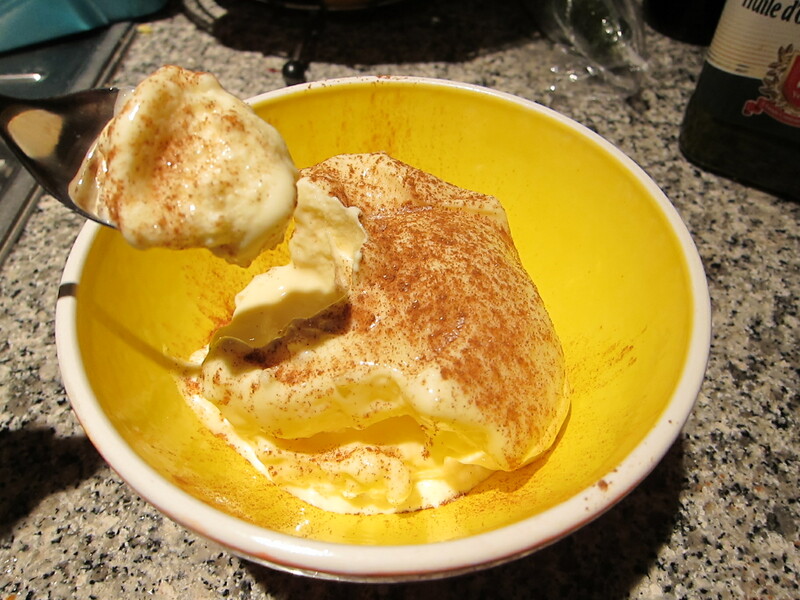 Swirl/blend the content of the moulds, and put them into the freezer. Ice pops are supposed to freeze firmly, so the relative lack of typically 'softening' ingredients (like more milk-fat, or a lot of sugar) pose no problems! In that sense, ice pops are perfect for testing out relatively healthy ice cream-formulas that otherwise simply would freeze too hard.